, the hawkish US national security adviser, has threatened the international criminal court (ICC) with sanctions and made an excoriating attack on the institution in a speech in Washington. Bolton pushed for sanctions over an ICC investigation into alleged American war crimes in . He also announced on Monday the closure of the Palestine Liberation Organization (PLO) office in Washington because of its calls for an ICC inquiry into Israel. “The United States will use any means necessary to protect our citizens and those of our allies from unjust prosecution by this illegitimate court,” Bolton said. He said the Trump administration would “fight back” and impose sanctions – even seeking to criminally prosecute ICC officials – if the court formally proceeded with opening an investigation into alleged war crimes committed by US military and intelligence staff during the war in Afghanistan or pursued any investigation into or other US allies. John Bolton, the US official launching a blistering attack on the international criminal court, is a longtime foreign policy hawk tapped by President Trump this year as his national security adviser. Bolton, 69, was named to the top post in March – Trump’s third national security adviser in just 14 months in office. Over a three-decade career in foreign policy, he has advocated frequent use of military force and disdained diplomacy and international institutions. Before joining the Trump administration, he was best known for a brief stint as president George W Bush’s ambassador to the United Nations – a body he openly sneered at, once saying that that if the 38-floor UN building in New York “lost 10 stories, it wouldn’t make a bit of difference". Bolton has called for bombing both North Korea and Iran. Less than a month before his appointment by Trump, he penned a Wall Street Journal making “the legal case for striking North Korea first". He was a harsh critic of the Iran nuclear deal, which Trump has now pulled out of, and went further, advocating military force against the country. A bombing campaign was the only way to stop Iran from acquiring nuclear weapons, he wrote in . He left a post at the rightwing American Enterprise Institute and as a commentator on Fox News. Bolton’s brief stint as Bush’s UN ambassador came to an end because the Senate would not confirm him. It’s not his first time tangling with the ICC - during the Bush administration, he the successful effort to prevent the US from joining the court. As undersecretary of state, he around the world negotiating two-way agreements in which countries pledged not to send US officials to the court. He also forcefully opposed the UN security council referring suspected genocide in the Darfur region of Sudan to the court, though the United States ultimately sat out that vote and the referral went forward. Bolton also held senior positions in the administrations of Ronald Reagan and the elder George Bush, and wrote a book summing up his views: Surrender Is Not An Option. He is derided by critics as a warmonger, but his own philosophy as “Americanist” – a close cousin to Trump’s “America First” slogan – and is no fan of traditional carrot and stick diplomacy. “I don’t do carrots,” he has said. Bolton vowed that the United States would retaliate by banning ICC judges and prosecutors from entering the US, imposing sanctions on any funds they had in the States and prosecuting them in the American court system. “If the court comes after us, Israel, or other US allies we will not sit quietly,” he said, also threatening to impose the same sanctions on any country that aided the investigation. He condemned the inquiry into war crimes in Afghanistan as an “utterly unfounded, unjustifiable investigation” and the court as illegitimate. “We will let the ICC die on its own. After all, for all intents and purposes, the ICC is already dead,” Bolton said. He said the US would negotiate more binding, bilateral agreements to prohibit countries from surrendering Americans to the court in The Hague. David Scheffer, who established the ICC on behalf of the US and served as the country’s , said: “The Bolton speech today isolates the United States from international criminal justice and severely undermines our leadership in bringing perpetrators of atrocity crimes to justice elsewhere in the world. The senior Palestinian negotiator Saeb Erekat confirmed that a US official had notified the Palestinian leadership that its diplomatic mission in Washington DC would be closed. The move follows a year of US action seen as detrimental to Palestinians, most recently the in humanitarian assistance. Trump has said the cuts were to make a peace deal, although his administration has not announced any specific efforts. Erekat said: “This is yet another affirmation of the Trump administration’s policy to collectively punish the Palestinian people.” He added that Palestinian authorities were taking “necessary measures to protect the rights of our citizens living in the United States to access their consular services”. “We reiterate that the rights of the Palestinian people are not for sale, that we will not succumb to US threats and bullying and that we will continue our legitimate struggle for freedom, justice, and independence, including by all political and legal means possible,” he said. The UN-backed ICC’s remit is to bring to justice the perpetrators of war crimes, crimes against humanity and genocide. The US did not ratify the Rome treaty that established the court in 2002. The then president George W Bush was strongly opposed to the court. President Barack Obama subsequently took measures to improve cooperation with it. 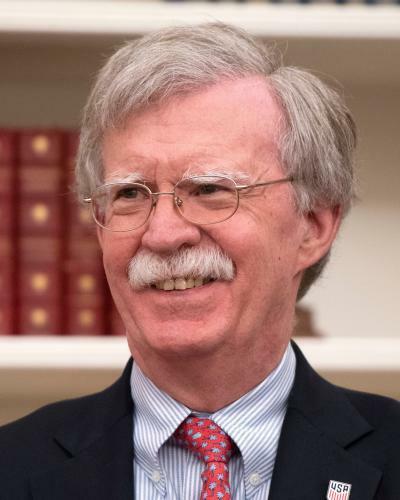 “We will consider taking steps in the UN security council to constrain the court’s sweeping powers, including to ensure that the ICC does not exercise jurisdiction over Americans and the nationals of our allies that have not ratified the Rome statute,” Bolton said. In May, Trump opened a , ending decades of consensus that the contested city’s status should be decided in future negotiations, as Palestinians claim its eastern parts while Israel claims the entire city as its capital. The embassy opening prompted the Palestinian president, Mahmoud Abbas, to reject Washington’s traditional role as a mediator, and stopping communication. Days later, the Palestinian foreign minister asked the ICC chief prosecutor, Fatou Bensouda, to into alleged Israeli war crimes, crimes against humanity, and apartheid. The referral came during a period of in Gaza as Israeli snipers shot hundreds of people attending weekly protests. is not a signatory to the ICC and has said the body lacks jurisdiction. The ICC launched a in 2015 into allegations of war crimes and crimes against humanity in Israel and the Palestinian territories. However, the court has not opened a full investigation that could ultimately lead to indictments. “We will not allow the ICC or any other organisation to constrain Israel’s right to self-defence,” Bolton said on Monday. A spokesman for the ICC said earlier on Monday: “The international criminal court is aware of media reports of the speech scheduled to be delivered by US national security adviser, Mr John Bolton, later today concerning the ICC.